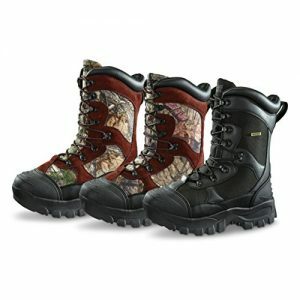 Ice fishing boots will bring essential toughness, traction, and insulation to some of the most extreme types of fishing. As an angler, you will need all the help you can get battling it out in cold and slippery conditions. Wearing the proper boots is a key part of preparing for an ice fishing trip. It will boost your chances immensely in landing some big game from a very precarious position. In a little bit, you will come to our section of reviews of the best boots for ice fishing you can by. The selections have been made based on criteria such as traction, insulation, flexibility, robustness and of course, value for money. For a quick glance at the selected models, you may refer the table featured below. The later generation of ice fishing boots is really a step on from the previous generation. While the traditional boots were laced well and provided good insulation, they were often cumbersome and difficult to fit on smaller foot sizes. The better ones are much easier on your feet as well as more flexible, lightweight and practical. Most anglers typically go for pac boots with a waterproof base and exterior made of rubber for ice fishing. This is because they take in no moisture whatsoever from the surrounding snow or ice cold water that might splash onto them. In fact, this brings us to the first feature you should look for when choosing your boots for ice fishing. Most of the high-end boots have an upper area made of nylon, tough leather and other stiff materials connected to a base made of rubber. 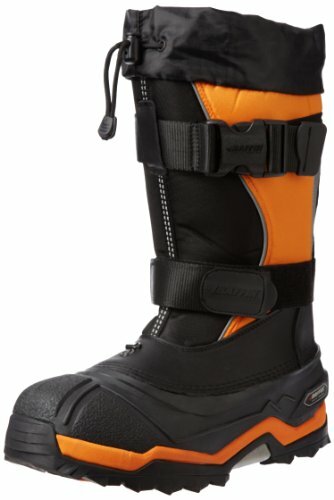 It would be even better if the boot can fit all the way up your calf as well for better insulation and protection. The presence of a gaiter at the top end of the upper boot is good for insulation from the elements. That can be an important part of waterproof functionality. And the fastening mechanism should also be a good indication of water resistance. The most convenient and effective are zips and buckles. They can be easily done while wearing mittens or ice fishing gloves. Also, look for liners on the boots since they can shorten the time it would take for the boots to dry up. When the terrain is snowy or icy, slipping is an ever present danger and in some areas, that can be lethal. Not surprisingly, the best boots for ice fishing come equipped with spikes on the soles to dig into the snow for increased traction. In any case, spikes or no spikes, it is best to consider the exact terrain and weather conditions you will be walking on. Designs for better traction keep coming up all the time so keep yourself updated on that front. As much as traction is important to maintain forward progress, you need grip to plant yourself in the same place without having to move involuntarily. Consulting professional reviews in this area can help. Snowy terrain can create plenty of situations for a nasty fall that could result in serious injury or worse. So the better your boots are at clinging for dear life, the better your chances of enjoying a safe fishing trip on ice. Insulating your whole body from the cold is important, especially your feet which help you move around. A lack of proper insulation can drastically decrease the circulation to your limbs and cause your movements to be slower. They can also expose you to some nasty frostbite. A good pair of boots will be made of materials that will keep the cold out as much as possible. Apart from rubber, there are other options that have insulating properties like zylex, heatseeker, opti-warm and wool felt. When it comes to dealing with deep snow, you should consider boots that cover you up to your calves. That will allow you to sink in deeper with the cold biting into your legs. We are not talking fashion here so much as function. Some boots look pretty hip but could not last long in the rough weather conditions and terrain. A good design incorporates all of the features that make a boot efficient and safe for the wearer while maintaining an aesthetic quality about it as well. Still, you are better off with an uglier boot so long as it works well. So when it comes to design, it is best to choose with your left brain rather than your right. In accordance with the aforementioned criteria, we can now take a look at the best matches and find out which one is right for you. Here are the reviews. The Sorel Men’s Conquest Boot features a rubber sole and upper area made of leather and fabric. The shaft measures an estimated 8 inches from the arch. It is waterproof and can insulate the wearer from temperatures as low as -40 degrees Fahrenheit thanks to its leather and 400-gram Thinsulate Ultra insulation system. 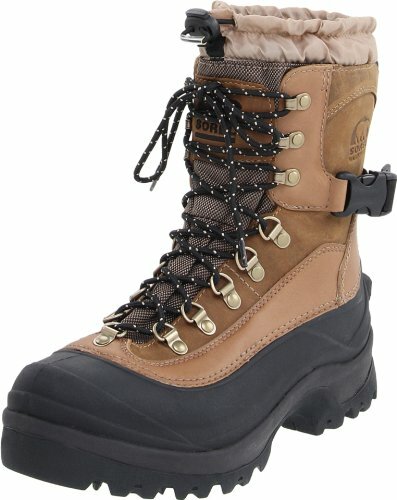 Another impressive feature is of this boot is an integrated gaiter bootie with a drawstring and barrel lock snow collar. The advanced technology all adds up to make this a proper boot for many activities in extremely cold conditions. There is much praise to be attributed to this boot’s long lasting support and comfort in extreme conditions. It is great for sustained trekking through extreme temperatures with good insulation. It is waterproof as advertised and sealed from other elements. You may even manage to stick with a single pair for several years. Doing up the laces can be troublesome and the Achilles adjustment strap feels cheap. Apart from that the design of the tongue has also been an issue. Since it is made of cloth, it is not as durable as other materials like leather. The Guide Gear Men’s Monolithic Waterproof Insulated Hunting Boots are quite warm thanks to 2,400 gram Thinsulate Ultra Insulation. t also has a waterproof, breathable membrane so your feet can remain dry and not suffocate at the same time. The rubber lug outsole is resistant even to oil so grip is certainly no weak point on this boot. In the pursuit of comfort, there is a removable, mesh-lined EVA insole for comfort, a moisture-wicking mesh lining as well as a padded tongue and collar. The 3/4-gusseted tongue locks out debris and water. Sure enough, the design that has been so focused on keeping your feet warm and snug is the main talking point with this boot. It is also considered very good value for money for a 2400 gram insulated boot. Certainly, efficient blood flow to the feet is key to making use of a lot of the other benefits. These boots have suffered from complaints of being too bulky and stiff. Until they have been properly worn in, it could be a hazard to try anything adventurous while wearing them. 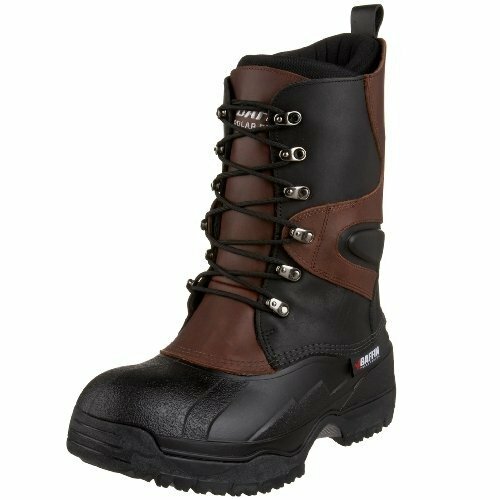 The Baffin Men’s Apex Insulated Boot has a cold rating down to -148 degrees Fahrenheit. It is a tall waterproof leather boot with a quick-lace system, pull-on loop, and lugged outsole for good grip. It also features Baffin’s infamous eight-layer removable inner boot system so it can insulate, comfort, and protect your feet with relative ease. As usual with their other boots, the build quality and efficient design associated with Baffin shine through with this model as well. The eight-layer removable inner boot system does not disappoint in providing a warm and comfortable fit. And when it comes to harsh weather conditions, this boot is pretty hard-core, not letting up easily to any elements that would like to sneak in and ruin your hike. On top of that, it maintains a classic sense of style about it which is always a welcome bonus. These boots have been claimed to be rather too specialized for certain winter activities. So they are not ideal or even enough of a compromise for some people. Other minor complaints are regarding the fit and stiffness of the construction. The Baffin Men’s Selkirk Snow Boot is extremely adept at dealing with harsh winter conditions. 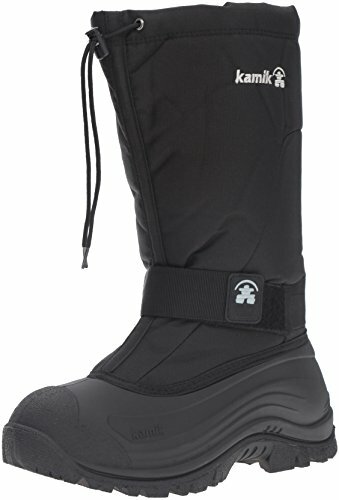 It is a knee-high snow boot featuring a drawstring at the opening, an adjustable calf strap with a compression buckle, and adjustable ankle strap with hook-and-loop closure. The shaft is approximately 13 inches from the arch. The heel is roughly 1.25 inches as is the platform. 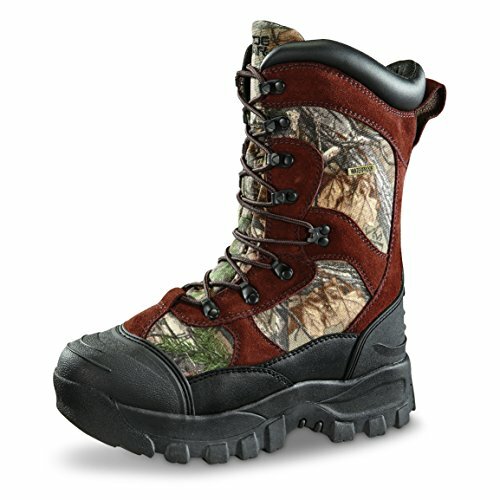 Boots from Baffin are reputed for their superior build quality, durability, and design features. With, this model not much of that has changed. It is a comfortable and warm companion for long walks in sub-zero temperatures, slippery surfaces, and even appalling blizzards. There have been complaints of products being too bulky and either too small or too large on the feet. Hence, you may have some reservations about deciding which size you should go for. However, it must be noted that these are isolated incidents and do not speak for the majority of the market. 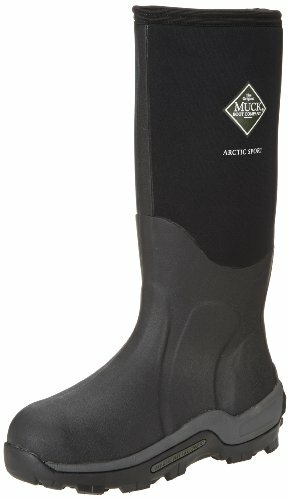 The Original MuckBoots Adult Arctic Sport Boot is insulated well enough to be worn in temperatures as extreme as -40 to -60 degrees Fahrenheit. On top of that, it is entirely waterproof. The upper area is made of rubber and fabric while the sole is made entirely out of rubber. The shaft is lengthy at around 14.5 inches from the arch. The heel is approximately 1.25 inches and the platform is approximately 0.75 inches. The Original MuckBoots’ Arctic Sport boot can deal with just about any messy situation the weather can throw at it – Snow, slush, freezing rain – the lot of them. The fact that the boot swallows up a large part of your leg gives you the confidence to step into deep snow or mud without the being weary of it contacting your skin. It is extremely waterproof and well insulated and its sole grips well enough to keep you firmly planted on whatever surface you dare tread on. Main criticisms have been about the fit-on. You encounter trouble with choosing their correct size. Apart from that, the boot has also been deemed too heavy and cumbersome for some. The Kamik Men’s Greenbay 4 Cold-Weather Boot is a cold-weather boot featuring a waterproof upper and a removable 8mm thermal-guard liner and hook-and-loop strap. It has been rated to -40 degrees Fahrenheit. It also has a midfoot adjustable Velcro closure strap for added snugness for each foot and a thick treaded rubber outsole for traction on slippery, icy surfaces. The shaft is approximately 13 inches from the arch and the boot opening is approximately 20 inches around. The obvious benefit of boots that fit high up your legs is that you have sufficient protection and insulation in deep snow. The insulation factor works just fine and there have been no problems with the waterproof part either. Criticisms have been made regarding weight, size and durability. There have been cases where the seams would begin to separate which would gradually render the boot no longer waterproof. Also, this boot suffers from an initial stiffness until it has been properly worn in. If you are extremely unlucky you might manage to get your feet wet every time you go out wearing them. But this is not a mainstream occurrence so the likelihood of encountering this problem yourself is improbable, to say the least. That concludes our list of reviews of our top recommendations for efficient boots for ice fishing. You may have noticed that they are not merely adapted for ice fishing alone but other winter activities as well which is a great benefit to have. They represent the latest in technology, design, and cost efficiency to keep your feet warm and protected from the harsh cold and chilly elements. It is important of course, for you to set a high standard beforehand, based on the relevant criteria of a good pair of ice fishing boots before making your decision. After weighing in all the factors, we are pretty confident you just upgraded your fishing experiences to a whole new level.